The definition of yin and yang correctly states it is a complex and enlightening philosophy and state of being. In feng shui, yin and yang's opposite energies are balanced in the spaces you live, work, and play to complete a whole. Yin yang is widely known as the two opposites that complete the whole. Yin is the shady place (north - feminine energy) while yang is the sunny place (south - male energy). Each relies on the other. The philosophy of yin yang helps define the inner workings of nature. It offers a concise explanation of why there is night and day, light and dark, good and evil, right and wrong, male and female, etc. In other words, it creates a framework so chaos has order. Without this concept, life would seem sporadic, and it would be difficult to see the patterns and logic behind the functions of life. Yin yang easily becomes a case of which came first, the yin or the yang? Do yin yang define spirituality, or does spirituality give purpose to yin yang? Unlike many philosophies, yin yang has a practical application to nature and spirituality. Since feng shui seeks to balance energy and create optimal energy flow throughout spaces, yin and yang is a central concept. The two energies of yin and yang are direct opposites. They feed each other the energy the other lacks. It is through this interchange that they transform from the inside out and become each other, creating the perpetual cycle of from life to death to life again. Yin energy is considered passive. Water is a yin energy, as are the sectors in your spaces that are governed by water. Its passive and receptive nature allows you to easily move your hand through it. Yin energy accepts and gives over to its surrounding energy. Earth is also yin energy. When yang energy is added to yin energy, it becomes either a creative or destructive element. The nature of passivity appears to be weak, but its strength comes in its ability to transcend other energies. Yang energy is aggressive. The power of yang energy is what drives creativity. Passion and fire fuel yang energy. Fire and air are yang elements. Everything has elements of yin and/or yang in it, including your body, mind, and spirit and things you bring into your spaces. Yin - The governing energy of your bedroom is yin but that's not to say yang energy is missing. This is a space for rest and receiving healing and nurturing energies. Yang - The dominant energy of your den and kitchen is yang energy. It is the creative and vital life-force energy. The energies within your body, within each organ, operate on the same premise of yin yang energy. There is a need for the energy system in your body to function in harmony. If there is an imbalance with the body's systems with either too much yin or too much yang, there will be disharmony or disease. 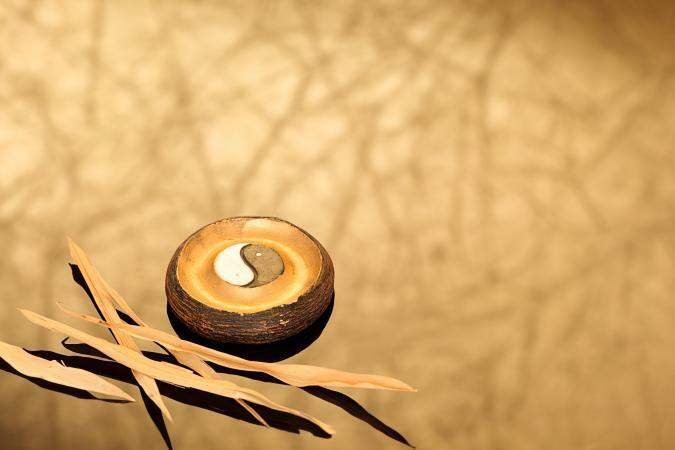 Chinese medicine and acupuncture apply the principles of yin yang in restoring health. Taoism defines yin and yang as two polar energies that fluctuate and interact in constant motion. If you observe the yin yang symbol of two curved teardrops with the black, right side descending while the white, right side is ascending. There is also an inner circle within each of the opposite color. There is an intentional depiction of movement in the symbol to convey that whenever yin and yang come together, they separate only to reconnect and join as one. Descending into life and ascending in death completes the circle of life. You can apply the principles of yin and yang to your every day life. If you don't have enough yin in your life, you can wear black, blue, silver, and other colors considered yin to enhance the energy surrounding you. The same is true of your environment. The essence of the ying yang definition can be experienced whenever you reach a meditative state of balance. By applying proper feng shui principles in your spaces and in your life, you can create more balance and harmony.